Home / Ukraine / I’m Visiting Ukraine – What Should I Eat? Ukrainian Proverb: Eat good food, sleep well at night; God will keep your health just right. When you don’t know the language, the letters as written on a menu are very different from what you understand, and you’re not familiar with the local cuisine, dining out in a different country seems very difficult! However, I assure you that eating in Ukraine will be an enjoyable and gastronomically exciting experience. 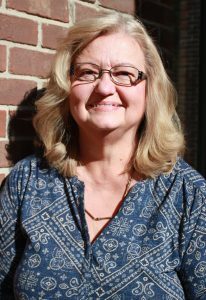 Fortunately, when I traveled to Ukraine, I not only was with a veteran Ukrainian visitor but I had also received some recommendations from one of our Ukraine staff members. This did help a great deal! However, many waiters speak at least some English, so they are willing to help you find an acceptable entrée from the menu. In smaller towns, English speakers may not be available, so pointing at pictures helps too! During one of our train trips across Ukraine, someone who also spoke English helped me order from the snack bar which made the line move a bit faster than it was when I was struggling to explain myself to the waitress. Never underestimate the power of asking for help! There are also standard American fast food restaurants like McDonald’s and Kentucky Fried Chicken if you find yourself craving something familiar. (Try the cherry pies at McDonalds!) However, I do encourage you to try the many traditional delights of Ukraine while you are there. My very favorite food item was the Green Borscht, a delicious soup made with potatoes, spinach and green onions, which was green in color, and decorated with a dollop of sour cream. It really was wonderful. 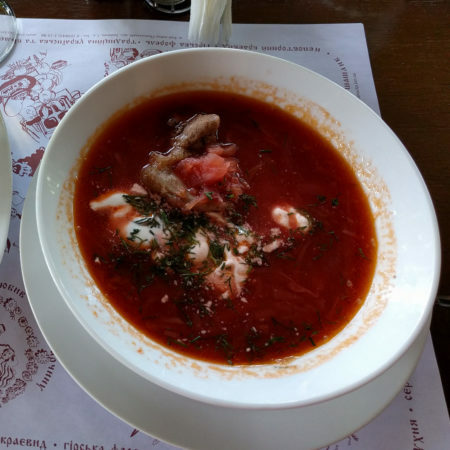 The Red Borscht or Borshch is probably more common however, and it is a vegetable soup made primarily out of beets, cabbage, potatoes, and tomatoes and, you guessed it, is red in color. These soups are often served with a wonderful brown bread that makes the soup a meal. Other items you commonly see are dumplings or varenyky which have various fillings inside of them, including fruit, potatoes and onions, cabbage, cottage cheese, or various meats. Sour cream often tops the savory dumplings. I had some meat dumplings known as pelmeni with pork and again, they were delicious! The pelmeni were wrapped in a thin unleavened dough and accompanied by sour cream. At breakfast, we had nalysnyky, or thin pancakes similar to crepes. The ones we had were filled with fruit and the cherries there are amazing. Nalysnyky can also be filled with items such as meat, cabbage and quark, a traditional, creamy, unripened cheese. Other traditional foods include seafood items, due to the proximity of the rivers and the Black Sea. Solyanka is a thick, spicy and sour soup made with meat, fish or mushrooms, and various vegetables and pickles. Don’t be surprised to find a dollop of sour cream on top. Yushka or ukha is a clear soup made from various types of fish such as carp, bream, wels catfish, or even ruffe, a small member of the perch family. As I am not a fish consumer, I cannot tell you much about those but you do see quite a bit of seafood on the menu. Holubtsi are cabbage leaves (fresh or sour) rolled with a rice filling and may contain minced meat or bacon. They are baked in oil and caramelized onions and may use as a baking sauce tomato soup, cream, sour cream, or bacon drippings; some may also be roasted with a strip of bacon on top. Kruchenyky or Zavyvantsi are pork or beef rolls with various stuffings inside, such as mushrooms, onions, eggs, cheese, sauerkruat, or carrots. These are good to have with mashed potatoes as a side dish. Deruny, or potato pancakes, are very common and as many dishes in Ukraine, they are served with sour cream. Another favorite of mine is Koleta po-kivevski or Chicken Kiev. Similar to what you would see in America, this is a chicken fillet pounded thin, rolled around cold butter and herbs, coated with eggs and bread crumbs, and then either fried or baked. It doesn’t get any better than this. The wines and beers in Ukraine are also good. You may also like Uzvar, a drink cooked from fried fruits and amber in color. Traditional American soft drinks, fruit juices, tea, and many brands of vodka are also readily available. I really loved the food in Ukraine. Be adventurous when you are dining in a different country. You may find something that delights you so much, you want to replicate it home in your own kitchen.